Edinburgh man Tim Poyser is getting close to the action in this week’s Open Championship – as Scottish amateur Connor Syme’s caddie. And the former Lothianburn and Turnhouse member is confident the young Fifer can shine on his major debut in the company of big John Daly. Poyser, who was brought up in Fairmilehead, turned to caddying after reaching 30 and deciding he needed a change from his job as a financial advisor for Standard Life. He spends the winters at an exclusive club, The Old Collier, in Florida and has been Syme’s first-choice caddie since the pair got to know each other a couple of years ago. 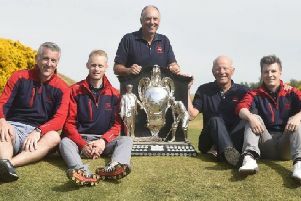 “I took a seasonal pro’s position at Ladybank two years ago and Connor is a member there,” said Poyser, speaking to the Evening News at the back of the 18th green at Royal Birkdale. “We just got talking and I also practised a bit at Drumoig Golf Centre (which is owned by Syme’s dad, Stuart) through Ross McConnachie, one of the pros there, being my room-mate in Dundee. “Last summer I was following Connor’s progress and I texted him as I know how important it can be for a player to have a steady caddie. We got together at the Scottish Amateur and he was unlucky not to win up at Royal Aberdeen. Poyser cut his own golfing teeth at Lothianburn before its decline led to him joining Turnhouse. His own golf now takes a back seat to a combination of caddying and arranging luxury golf trips to Scotland for Americans in a self-employed role with a company called Connoisseur Golf. “I was a personal IFA with Standard Life but, when I turned 30, I found myself asking, ‘do I really want to do this for the rest of my life?’ The answer was no. “Ally MacKenzie, a fellow Edinburgh man, got me out to Floirda for eight months and I had the time of my life there. “I started caddying at The Renaissance and got to know the then director of golf, David Armitage, who made me the caddie master. Syme, the world No.8, secured his place in this week’s event by sharing top spot with American Julian Suri in one of the final qualifiers at Gailes Links, where Poyser was also on duty. “I’ve done a couple of European Tour events, including the Dunhill caddying for celebrities, and also a couple of events on the Challenge Tour, but this is on a different scale altogether,” he admitted. “However, I’ve cadded enough to know that it’s just about the process. I know Connor’s game inside out and it is just a case of sticking to that process. “I feel 100 per cent confident that he’s got the game to do well here. He is hitting it really good.